On March 28 the Moderate Resolution Imaging Spectroradiometer or MODIS instrument aboard NASA's Terra satellite provided a visible image of Joaninha. Joaninha had maintained its eye, although appearing more ragged looking than in satellite imagery the previous day. The ragged eye was surrounded by powerful thunderstorms in a thick eyewall. The sea surface temperatures in the area of the tropical cyclone were still warm enough to support and maintain the tropical cyclone. Infrared satellite imagery provides sea surface temperature data. Tropical cyclones need sea surface temperatures of at least 26.6 degrees Celsius (80 degrees Fahrenheit) and Joaninha is moving through an area where the sea surface temperatures range between 26 and 28 degrees Celsius (78.8 and 82.4 degrees Fahrenheit). 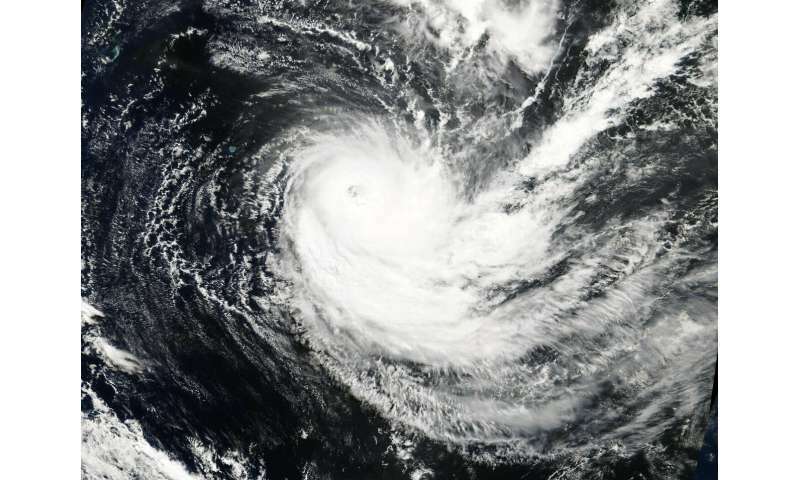 At 5 a.m. EDT (0900 UTC) on Thursday, March 28, 2019, maximum sustained winds near Joaninha's center were near 115 knots (132 mph/213 kph). Joaninha was centered near 21.2 degrees south latitude and 67.4 degrees east longitude. That's about 570 nautical miles east of Port Louis, Mauritius. Joaninha is expected to move into an area that is unfavorable for it to maintain strength. The Joint Typhoon Warning Center or JTWC noted "Increasing westerly vertical wind shear associated with a mid-latitude trough (elongated area of low pressure) approaching from the southwest will compete with flow into that trough to produce a gradual weakening trend" as Joaninha tracks southward and along the edge of an area of elongated high pressure, located to the east. In four days, Joaninha is expected to merge with an area of low pressure and transition into a subtropical storm. What is a Sub-tropical Storm? According to the National Oceanic and Atmospheric Administration, a sub-tropical storm is a low-pressure system that is not associated with a frontal system and has characteristics of both tropical and extratropical cyclones. Like tropical cyclones, they are non-frontal that originate over tropical or subtropical waters, and have a closed surface wind circulation about a well-defined center. Unlike tropical cyclones, subtropical cyclones derive a significant proportion of their energy from baroclinic sources (atmospheric pressure), and are generally cold-core in the upper troposphere, often being associated with an upper-level low pressure area or an elongated area or trough of low pressure. In comparison to tropical cyclones, these systems generally have a radius of maximum winds occurring relatively far from the center (usually greater than 60 nautical miles), and are generally less symmetric.